Remembering today the simple things in life can be the best foods and healthiest meals to eat in the world! A simple fresh salad that goes great with any meal. We usually serve this in warmer weather but the taste of this salad keeps Summer top of mind! Grilled chicken, corn on the cob are also perfect with this salad. Keep the fresh taste of summer is a great advantage using fresh vegetables. Then the bonus is using all fresh herbs with fresh vegetables. Try some combinations of flavored olive oils for a nice change of flavors. Garlic, basil and rosemary added to regular olive oil with the addition of 18 year old aged balsamic vinegar make it super special. You can make your own style dressing of what you like. Serve this using a hard crusted Italian Bread and dip it into this marvelous juice that the salad makes! For me it's a whole meal in itself nothing else needed! In a small bowl add everything together oil, (except vegetables) and mix with salt, pepper to taste. Add a pinch of cayenne pepper for a little heat if you like. Toss with vegetables. 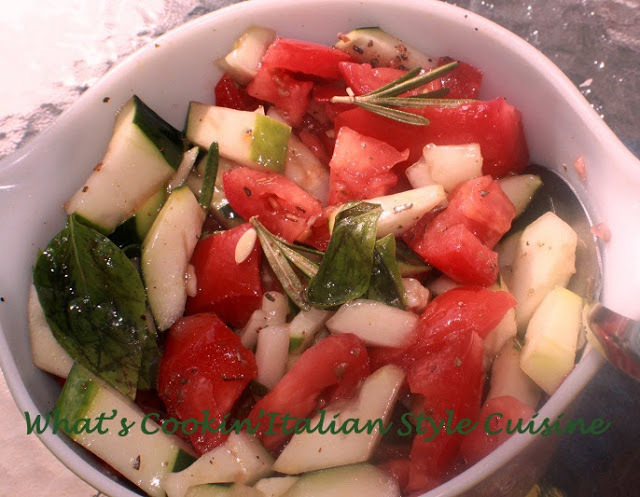 Serve with Italian bread to dip into this marvelous salad! Taste great the next day too!